One of my all time favorite snack ideas from our meal planning site are these freezer banana bites! 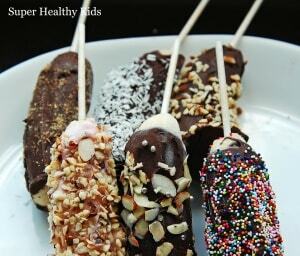 Made with slices of banana and dipped in chocolate and coconut, they make a perfect bite sized summer snack for little ones. Bananas are a natural antacid! Have your kids ever gotten heartburn? Bananas can help! They are high in B vitamins, which means they can help improve nerve function. They are also a good source of fiber. So many kids have bowel trouble, fiber is a great way to relieve that. So, go grab some bananas and cut them into chunks. Arrange on a cookie sheet lined with wax paper or parchment paper with a toothpick in each banana. Freeze first, bananas only, for about 1-2 hours. This is the most important part! Dipping a banana that isn’t frozen makes the process difficult and messy! After bananas are frozen, the chocolate adheres to the banana much more easily. These are awesome! The frozen banana inside is perfect and creamy like a little bite of ice cream 🙂 This reminds me – I have to make some of these! 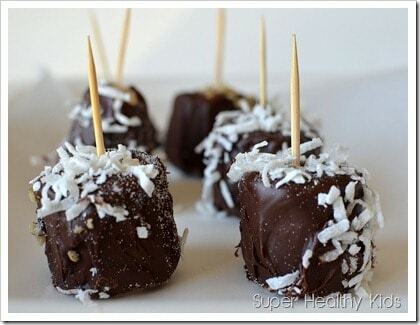 Love that you dip yours in coconut. Amy — sweetened or unsweetened coconut? Looks delish — can’t wait to try them! I’ve used both, so use whatever you have on hand or that your kids like! Good luck!! I made these tonight and had a hard time with the chocolate. What’s the best way to melt it? i love this idea! I’m going to make them for my son to bring to school and have during snack time. My question is this: should I take them out of the freezer that morning? After the chocolate is frozen can they be transferred to the fridge? I used peanuts and sea Salt!! Yum.